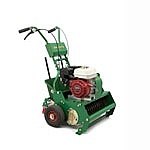 Powered scarifiers are essential for removal and control of thatch. The SISIS Auto Rotorake Mk5, Rotorake 450 and Rotorake 602 & 602S are powered scarifiers suited to amenity and ornamental lawns. 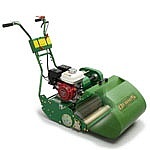 They are heavy duty machines to suit lawn maintenance requirements. The SISIS Veemo Mk2 and Rotorake TM1000 tractor mounted scarifiers are used for maximum thatch removal and offer fast ground coverage, ideal for large areas such as amenity and ornamental lawns. Powered aerators keep amenity and ornamental lawns in prime condition and SISIS offer the Dart, Supaturfman, Arrow Aer-Aid and Arrow for your golf course maintenance requirements. These aerators are independently powered. The SISIS range of tractor-mounted aerators comprises four machines which are suitable for amenity and ornamental lawn maintenance. The Multitiner 1.8m, Multitiner 1.2m, Mounted Rolaspike and Javelin Aer-Aid are versatile machines. The Multitiner machines are tractor-mounted drum aerator, the Rolaspike is a tractor-mounted Sarel type roller and the Javelin is a vertical action, air-injection aerator. SISIS Megaslit, Maxislit and Multislit are deep slitters suitable for use on fine or outfield turf. 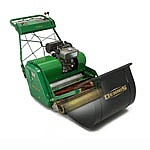 Their deep clean slitting action with minimal surface marking are ideal for amenity and ornamental lawn maintenance. The single pass maintenance system incorporates a mounted frame which accepts a variety of different implements for use on both turf and hard porous surfaces. The SISIS Towed Implement Frame is designed specifically for daily maintenance fo a wide range of surfaces, maximising surface life. Ideal for towing behind small compact garden tractors. The SISIS Variseeder 1300 is a versatile tractor-mounted seeder that is ideal for amenity and ornamental lawn maintenance. Its seeding rate is variable and is simple and accurate to set by Zero-Max box. The SISIS range of tractor-mounted sweepers comprises three products - Litamina 1200 & 1500, Litamisa 1800 and SSS1000 and all three can be used for amenity and ornamental lawns. The Litamina and Litamisa sweep and collect all kinds of surface debris while the SSS1000 is a rotary brush. The versatility of SISIS's Flexibrush and Varibrush products makes them ideal tool for artificial and synthetic turf maintenance, including amenity and ornamental lawn care. 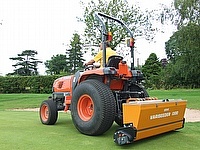 The Flexi400 interchangeable unit provides fast and effective coverage on large areas so it is an ideal tool for amenity and ornamental turf maintenance. It has seven fully floating heads, allowing it to follow ground contours and can be used for dew removal, striping and lifting grasses. The SISIS Powaspred is an excellent tool for amenity and ornamental turf maintenance. It has infinitely variable spreading rates and an oscillating base plate to reduce bridging. The incredibly versatile SISIS Truspred is a hand operated spreader and top dresser which applies grass seed or top dressing material to small areas - which makes it ideal for amenity and ornamental turf maintenance. The SISIS Trulevel is a bowling green roller that can also be used for maintenance of amenity and ornamental lawns. Over-riding action on slight hollows allows level areas to be firmly rolled, whilst low areas are left, so that the playing surface is progressively levelled. Outer rollers can be raiesed concentrating the whole weight on the centtre cylinder if required. The wide range of SISIS hand operated tools will enable you to effectively maintain aminenity and ornamental lawns. The SISIS Dragmat is a towed dragmat with a working width of 270 cm (9 feet) used for a wide variety of surfaces and applications. It is suited to amenity and ornamental lawn care. 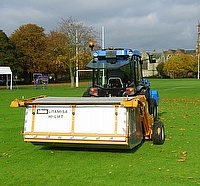 Fast, effective matting-in of sand, top dressings and fertilisers is provided by the dragmat. 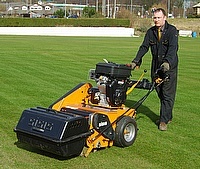 "I've used a Sisis scarifier for three years in the preparation and maintenance of the county wickets at Guildford CC and find it a fantastically powerful tool for mid season repairs and scarification." "We use the Varibrush to remove the early morning dew, stand grasses up prior to cutting and aid with the presentation of the college sports grounds and lawns." The Razor Ultra 560 has been developed to specifically meet the demands of local authority and contractor lawn maintenance. The mower is perfect for lawn maintenance. This professional mower has a 560mm (22") cutting width and incorporates many key features, 11 bladed cutting cylinder, ultra short wheelbase for undulating surfaces, tungsten tipped groomer, click height adjusters and stub free transport wheels. 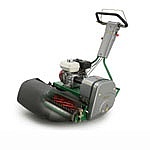 The Razor 560 has been developed to specifically meet the demands of local authorities and contractors, from private lawns to commercial lawn maintenance. 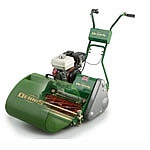 The mower is perfect for cutting lawns. 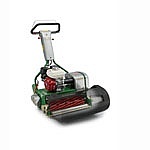 This professional mower has a 560mm (22â€) cutting width and incorporates many key features, 11 bladed cutting cylinder, ultra short wheelbase for undulating surfaces, tungsten tipped groomer, click height adjusters and stub free transport wheels. Our newest machine, strong, simple design with 20â€ (51cm) and 24â€ (61cm) cutting widths ideal for local authority and contractor lawn maintenance requirements. Excellent quality cut for this dedicated professional mower. Built on the FT principle, the Super Six is almost the same with simpler height of cut adjustment ready for your grass maintenance requirements. Available as 17â€ (43cm), 20â€ (51cm) and 24â€ (61cm) widths. Interchange cassette system giving option to fit 10 different heads including scarifiers, verticutters, brushes, spikers and slitters as well as 5 or 9 blade cutter cassettes with 15 seconds changeover of cassettes. 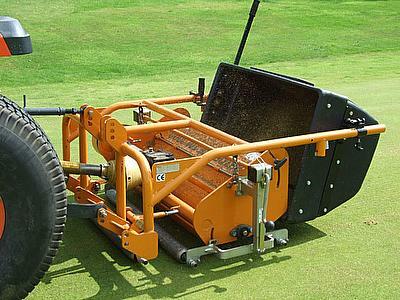 Built on the FT principle these quality mowers are interchangeable cassette systems with one minute changeover giving options to fit 8 different heads including scarifiers, verticutters, brushes, spikers, slitters as well as 6 or 8 bladed cutter cassettes. Available as 26â€ (66cm), 30â€ (76cm) and 34â€ (86cm) widths. 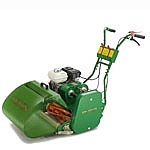 Ideal for lawn grass maintenance requirements,. The Dennis heavyweight 30â€ (76cm) and 36â€ (91cm) diesel powered dedicated machine, 3 section rear roller and steering brakes make this 350kg machine easy to manoever and suitable for local authority grass maintenance requirements. Excellent stripe pattern and rolling characteristics. This dedicated machine brings professional verticutting to every facility from private lawns to university grounds. 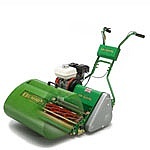 With a 510mm (20â€) operating width and tungsten tipped blades, it is ideal for local authority lawn maintenance. 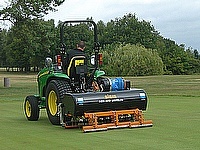 Regular use of this machine will help reduce thatch, improve the sward and encourage finer grasses to flourish. The S500 PLUS is an easy to use 'dual -purpose' machine and is ideal for maintaining local authority and contractors grass lawns. 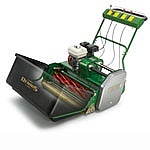 The machine has a 510mm (20") operating width and has interchangeable spiker and slotter reels. The spiker reel punches through the "surface pan" allowing air, water and fertiliser to penetrate the root zone, whilst the slotter reel creates ideal seed germination pockets. An optional seed box is available. 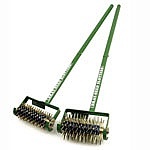 The hand slotters and spikers have interchangeable reels with replaceable wearing parts and are ideal for maintenance of small areas of a grass lawn. Local authority mower security is enhanced with a Mowersafe, which is suitable for any make of mower upto a 36â€ cutting width. Ideal for local authorities and schools. 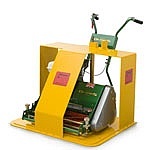 Prevents a thief from rolling away your machine and coupled with the mower's weight, any attempt to carry away the machine is extremely difficult.